We will be participating in the 32 China International Plastics and Rubber Industry Exhibition, we invite you to visit us for guidance.-Zhang Jiang Automation (Jiangsu) Co.Ltd. We will participate in the 32 China International Plastics and Rubber Industry Exhibition held at Shanghai Hongqiao National Convention and Exhibition Center from April 24 to 27, 2018. We sincerely invite you to visit our platform for guidance. In this exhibition, the company will display a new generation of automatic weighing and blending system entity prototype developed by the company independently. The biggest feature of this upgrade is that the system adds self-learning optimization algorithm, which can be based on the type of materials. In the real-time measurement process, the control parameters are continuously optimized and adjusted automatically. The more the number of batches, the higher the accuracy. In addition, the functions of automatic bagging and automatic bag picking are added to the hardware functions. It further improves the automation of the whole process and the efficiency of the operation. In addition to displaying the physical prototype of the small material weighing and proportioning system, You can also find out about the main material automatic proportioning system (auxiliary equipment on the mixer, information management system of the Mixer workshop) and other related information management software. Welcome to consult and understand. We are adhering to continuous technical innovation for users to create value. The company has established Jiangsu Provincial Polymer Intelligent production equipment Engineering Technology Research Center, Jiangsu enterprise graduate workstation and Jiangsu Province foreign R & D institutions and other innovative platforms more than 40 full-time R & D personnel specializing in industry technological innovation. The company maintains close cooperation with many colleges and universities, relying on the talents inside and outside the enterprise, relying on the continuous enhancement of innovation ability, outstanding flexible customization ability, Increasingly perfect delivery and after-sales service ability to win the trust and cooperation of customers around the world, widely recognized by industry users. 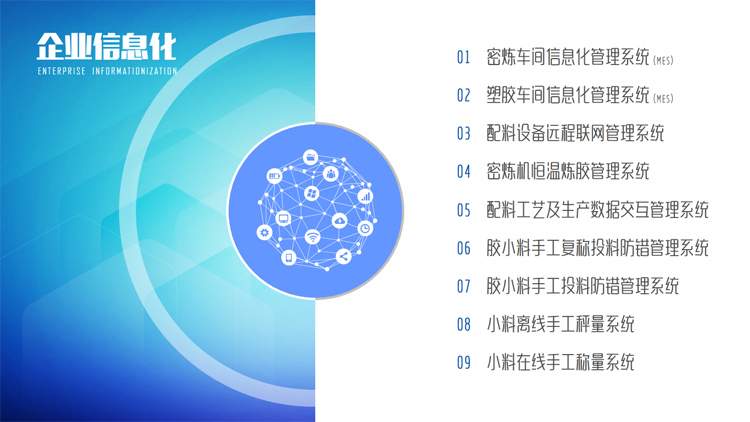 In the future, the company will continue to focus on ingredients and production information management technology research, sincerely hope to join hands with you to cope with the challenges of the industry 4.0 era with each passing day.